Start with the grits, since they need to simmer along, with an occasional stir, while you do the rest of the preparation. The secret to getting rich, cooked, creamy, textured stone ground (NEVER quick cooking) grits: Use half milk, half water in the suggested proportion of 1 cup stone ground grits to 4 1/2 cups liquid. Salt the grits, and cook on the lowest possible simmer for 45 minutes, stirring often. Cook longer if needed to get a thick but stirrable consistency. Add salt to taste, and, if you like, a bit of Parmesan or cheddar cheese. Add a little cream or butter if you want softer, richer grits. As the grits get underway, slowly cook a chopped purple onion (or whatever onion you have) in a generous amount of olive oil in a cast iron skillet or other heavy bottomed sauté pan. This will take 10 - 15 minutes. As the onion cooks, wash the greens and remove any thick, tough stems. Leave the greens slightly damp from washing. When the onion is tender and limp, dump the kale into the skillet with the onions. Sprinkle on sea salt and black pepper if you like. Use two wooden spoons to stir and gently toss the greens until they wilt. Cover and cook another couple of minutes to soften the slightly tough small stems. Taste and judge: more salt? A little more cooking time? Lemon juice, crushed red pepper, vinegar? 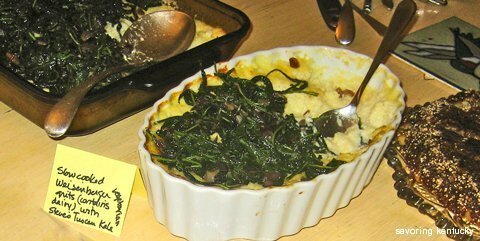 Or just serve the greens straight up with the blossomed-out, creamy grits, and enjoy the contrast of the greens' dark flavor, punctuated by the sweetness of the onion, smoothed out by the creamy, chewy grits.